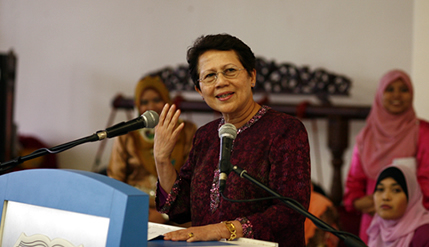 BANGI, 22 Nov 2013 – Outgoing Vice Chancellor of The National University of Malaysia (UKM) Prof Tan Sri Dato’ Seri Dr Sharifah Hapsah Syed Hasan Shahabudin has been described as a person of great strength, vision and very much dedicated to her work. The Prime Minister wife Datin Paduka Seri Rosmah Mansor said in her speech at an Appreciation Celebration for the VC that she is a special person and a good friend to her personally. The event held at the National PERMATApintar Centre Complex in UKM is to celebrate Prof Sharifah Hapsah’s contributions to UKM and serves as a farewell party as her contract with UKM ends at the end of the year. Deputy Vice Chancellors, Prof Datuk Dr Noor Azlan Ghazali (Academic and International Affairs); Prof Dato’ Ir Dr Othman A. Karim (Student and Alumni Affairs) and Prof Dato Dr Saran Kaur Gill (Industry and Community Partnerships) attended the function. Datin Paduka Seri Rosmah related Prof Sharifah Hapsah’s struggles in facing various obstacles in running a university and most especially in her efforts and time spent in building up and promoting PERMATApintar programmes. She attributed the smooth running of all the PERMATA programmes to the hard work and dedication of Prof Sharifah Hapsah to a point where new PERMATA programmes were able to be introduced and carried out. “I saw that there were a lot of social problems facing our youths and children; so I set out to tackle them. But I could not do it alone, so I turned to the professionals and the academics for help,” Datin Paduka Seri Rosmah said. She related the many discussions and meetings she had with various women professionals, including Prof Sharifah Hapsah in figuring out a way to help the youths culminating in the PERMATA Negara programme. “It is great to see how far the PERMATA programmes have grown to five such programmes in UKM, with two more in the offing. It would not have been possible without the help, the sacrifices and the dedication of many people, most importantly, Prof Sharifah Hapsah,” Datin Paduka Seri Rosmah said. The Appreciation Celebrations ended with choir singing and other performances by children of the PERMATA Seni.